Best known for his athletic speed, explosive and domineering body size, American football outside linebacker, Jadeveon Clowney is one player who has distinguished himself as a successful and dynamic player with a repertoire of great moves and natural power. His physical strength, agility and active hands have helped him earn a good stance in the Football League. Since the South Carolina native joined the National Football League in 2014, he has garnered a good number of awards and recognition, thanks to his athletic performance. Jadeveon Davarus Clowney was born to David Morgan and Josenna Clowney on February 14, 1993, in Rock Hill, South Carolina, USA. He grew in Charlotte, North Carolina, with his maternal grandparents John and Josephine Clowney as his father was incarcerated for about twelve years for robbing a Rock Hill check-cashing business and his mother worked as a processing technician at the Frito-Lay plant in Charlotte, North Carolina. The young African-American started his football career in South Pointe High School where he was active with the South Pointe Stallions football team. He played as a running back as well as a defensive end and finished with 17 sacks, despite having a bone spur in his foot. Even when his teammates graduated and moved to college, Clowney stayed back to play with his team, leading them to the state semi-finals even though they lost to the Northwestern. Jadeveon finished his high school career winning the 2010 South Carolina Mr Football Award and recognition as the best player of his class. After a great performance in high school, Jadeveon moved to the University of South Carolina where he joined the South Carolina Gamecocks football team and played from 2011 through 2013. In his freshman year, he was recognised as the SEC Freshman of the Year after recording a total of 36 tackles. Even the League of coaches named him to Freshman All-American First-team and All-SEC second-team. Other awards he won include the ESPY Award for best play hit and the 2012 AT&T All-American Player of the Year Award. The young player left his senior year to join the 2013 NFL draft. He left his college career recording 129 tackles, 47.0 for a loss of yardage and 24 sacks. 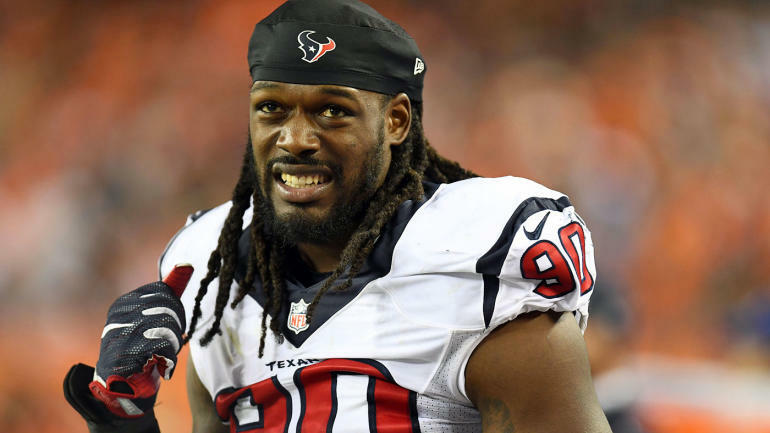 Joining the National Football League in 2014, Jadeveon Clowney was selected as a first-round pick by the Houston Texans and on June 6, 2014, he officially became a professional player after signing a four-year contract worth $22.272 million with a signing bonus of $14.518 million. Clowney debuted as a professional player on August 9, 2014, during his team’s first preseason game against the Arizona Cardinals. There, he recorded a tackle for a loss of 5 yards and made his first professional sack in the second preseason game against the Atlanta Falcons. In 2015, he recorded 40 tackles, 4.5 sacks, with 6 passes defended in a total of 13 games. Moving higher in his football career, Jadeveon earned the awards for the First Team All-Pro in 2016 and was named to his first Pro Bowl after recording 16 tackles for a loss, 6 sacks, 1 forced fumble, 2 passes defensed and 52 total tackles in 14 starts. The 2018 season went quite well for the young African-American as he recorded 4 tackles, 2 two sacks, recovered a fumble and returned it for a touchdown in a 37-34 win over the Indianapolis Colts, despite being fined $40,110 for illegally sacking the Philadelphia Eagles QB Nick Foles. His career stats as of 2018 records a total of 205 total tackles with 54 assisted tackles and 29 sacks. Following his $22.272 million contracts with the Houston Texans, which featured a $14.518 million signing bonus in 2014, the American football outside linebacker is expected to earn a base salary of $13.846 million. This, as a result, puts his net worth at $13 million. 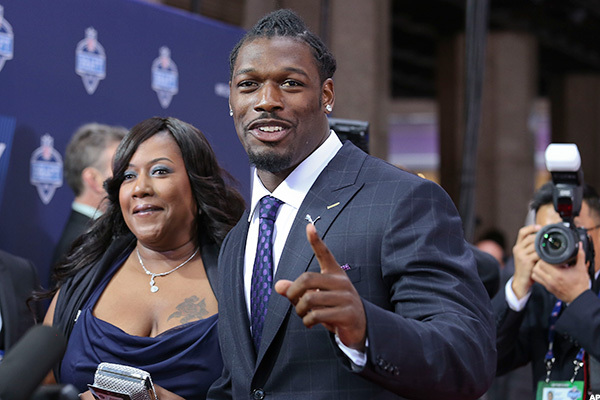 Jadeveon Clowney grew up with his maternal grandparents John and Josephine Clowney who were supportive of his football career while his father was away, serving his term in prison. Although there is no report about any of his siblings, the young player was also close to his mother’s boyfriend Christopher Jones. Looking at his love life, he is said to be in a relationship with Najah Re whom he met at the University of Houston in 2012. There is also no information about their marriage but the two still live together as a couple with their son, Jahlil Clowney who was born in mid-October 2015. Jadeveon Clowney is considerably tall and fit for his football position. The 6 feet 5 inches tall young athlete also weighs 266 pounds, which is considered huge but perfect for his defensive role. The length of his arm is 34.5 inches while the size of his hand is 10 inches.